Local, family-run hearing care company, The Hearing Care Centre have organised their inaugural Charity Golf Day to take place this summer. Whether you are a keen golfer or a complete beginner, they have a fantastic afternoon lined up for you! You will enjoy 18 holes of golf across this stunning course of golf, which will be played in stableford format, but also you will be competing for a range of other challenges including the longest drive, closest to the pin, hole in one, and a special beat the pro face-off. Lots of brilliant prizes are up for grabs. Teams of 4 are required. 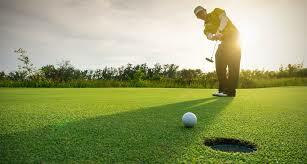 You will receive three hours of tuition with a PGA golf professional. Beginners will find learning the game of golf enjoyable in this relaxed, supportive and interactive program devoted especially to the needs of the beginner golfer. Throughout the afternoon you will learn all about the short game (chipping, putting etc. ), teeing off, how to choose the right club and much more. There will also be a number of competitions running to keep things exciting. All of the equipment will be provided on the day. After you have worked up an appetite, you will meet up with the other group at the clubhouse to digest the day’s happenings and enjoy a delicious BBQ (with all the trimmings) served at around 6pm. At this point, you are more than welcome to invite your family and friends along for dinner – they will just need to pay £15 for adults and £10 for children under 12. The day will end with an awards ceremony, presenting fantastic prizes to all of the winners. There will also be a prize draw so there are even more chances to win! Your ticket will cover all of the above plus a donation towards Hearing Dogs for Deaf People. The cost for both golfers and non-golfers is only £50 per person. Teams of 4 are required for golfers. To book your place for this exciting event, please visit hearingcarecentre.co.uk/golf or call The Hearing Care Centre on 01473 230330 for more information.